Have you heard about “Chicken Corsage?” It’s the latest #HowDoYouKFC campaign running in the US by fast food giants KFC. As you might have guessed the theme is centred on the high school prom season. The campaign sees a young man who exchanges his dance partner’s gift of a boutonniere with a KFC drumstick attached to a baby breath wrist corsage. KFC is encouraging fans to visit the Chicken Corsage site, kfc.com/corsage, where they can make their special order through Nanz and Kraft Florists for $20. 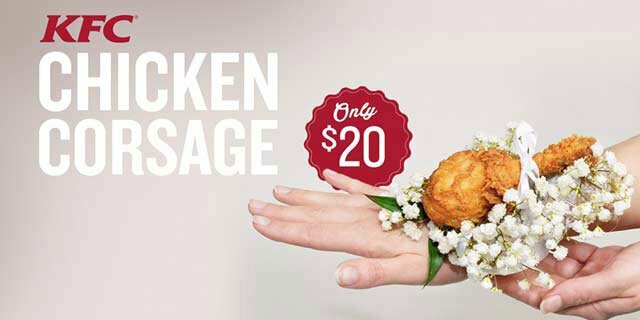 Gift givers are able to take their corsage and voucher along to KFC for their choice of Original Recipe, Extra Crispy or Kentucky Grilled Chicken, to surprise their date with a chicken corsage that will “make her eyes light up and her mouth water”. The second stage of the campaign involved Twitter; followers were delivered a KFC corsage along with a #promposal.